The Hughes Corn Flower pattern is distinctive with its petalled flower, grid like interior and elegant sweeping stems. Care was taken to maintain the integrity of the pattern throughout the three quarters of a century of production life. The hand-cutt glass of Corn Flower was done in a five step process: Step One: “spotting”—marking out the positioning of the flowers with dash-like cuts Step Two: “six-siding” and “stemming”:—the interior grid-like design of authentic Corn Flower forms hexagonal patterns; graceful arching stems also were cut in this stage. Step Three: “leafing”—distinctive leaves formed with a pair of elongated semi-circles that end in a point Step Four: “petalling”—a series of shallow cuts usually forming twelve petals, however this number did vary when space was restricted on smaller surfaces. On items with very little room a Corn Flower bud design was used. Step Five: “fringing” or “nicking”—the tips of the petals were decorated with a series of small cut lines. BW.J. 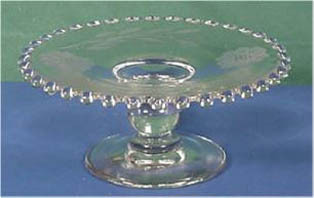 Hughes imported almost exclusively American elegant glassware blanks for production of his Corn Flower over the first thirty years of business. To this date little documentation has been unearthed from these early years. Hughes apparently believed that word-of-mouth was the best way to grow a business. Consequently, and unfortunately for researchers, he did virtually nothing to advertise his wares through standard trade magazines or through print media. Several 1920’s Heisey invoices are mentioned in Hughes Corn Flower correspondence from the late 1960’s. 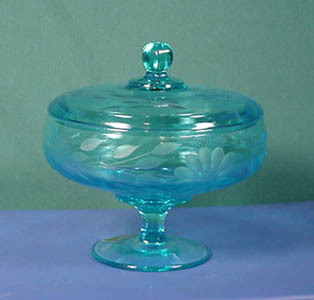 Other evidence has been gathered through viewing of Corn Flower collections and observations as to what has been available at Depression Glass Shows, general line shows and antique markets. By far the most informative, intriguing and at the same time puzzling source of information about glass blanks purchased by W.J. Hughes in the 1930’s is found in the advertising photographs. This catalogue was produced in the late 1930’s for use in the Hughes’ showroom and for his first distributor, Haddy, Body and Company, by the Toronto-based photographer J. Thornley Wrench. Shapes found in this early catalogue on which Corn Flower was cut include: stemware, serving pieces such as platters and relish dishes, cream and sugar sets, salad plates, sherbet dishes, vases and bowls. 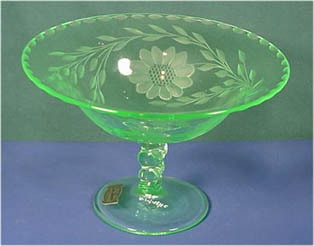 The most constant source of glass blanks for Corn Flower over the years was the Imperial Glass Company, established in 1901, in Bellaire, Ohio. Imperial’s Line #400, best known as Candlewick, was a favourite medium for the Hughes Corn Flower cut. 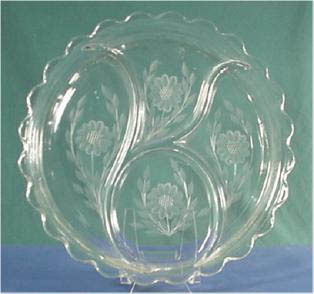 Introduced in 1936, this line flourished until the closure of the Imperial Glass Company in 1986. Three main reasons exist for the long working relationship that Corn Flower enjoyed with Imperial. First of all, the quality of Candlewick in its consistency a clarity made it excellent for cutting. Secondly, the number of items in this huge line of blanks, numbering some three hundred in all over the years, gave a fine selection of pieces with ample smooth surface area for working. Lastly, the Candlewick line was in production for an astoundingly long period of time, fifty years. Ed Kleiner, the Imperial Glass Company’s sales representative for Canada through to the mid-1950’s, stated that only once in his career did he receive an order for an entire box car-load of Candlewick—that order was shipped to Hughes Corn Flower Limited. W.J. Hughes passed away suddenly from a heart attack on April 17, 1951. He was seventy years old. His many faithful customers and friends travelled from across Canada to pay their respects. 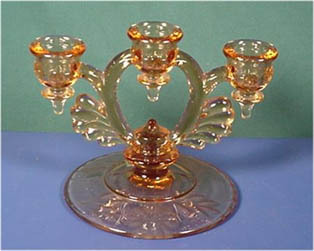 Many of the major American glass firms also sent representatives. Pete Kayser, as secretary-treasurer of W.J. Hughes and Sons Corn Flower Limited placed the following notice in the June 1951 edition of The Trader and Canadian Jeweller:** Originator of the world famous Corn Flower pattern, the late W.J. Hughes left behind him a tradition of fine glass cutting which is the exclusive and proud possession of our Company. Because of this inspiration, this heritage, we feel that W.J. 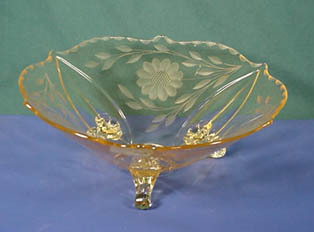 Hugh Fine Glassware is in a class by itself.... No pattern ever cut in fine glass has ever proved to be so popular as the Corn Flower which Mr. Hughes originated.